The Saturn V that sent Apollo 11 up sits on the ground at Kennedy Space Center. Saturn V was the name of the kind of rockets used by NASA in the Apollo program. The Saturn V carried Apollo 11 and the people in it to the Moon in 1969. 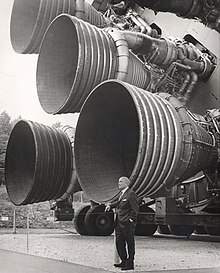 Much of the rocket was planned by German engineer and scientist Wernher von Braun. There were 32 Saturn rockets sent up to space, and the Saturn V was the largest. There were 15 Saturn V rockets made and 13 were sent up to space. There were two Saturn V tries with no people in them, and the first manned Apollo flight using a Saturn V was Apollo 8 sent up to space on December 21, 1968. The Saturn V rocket was a three part machine. It stood 110.7 m (363 ft) high and weighed 2,903,020 kg (6,400,064 lb). The first rockets were able to carry 44,600 kg (98,326 lb). This was went up to 46,800 kg (103,176 lb) for the later Apollo flights. The first and second stages gave the power to lift the rocket off the Earth. The first and second stages each had five engines. The first stage burned kerosene and liquid oxygen together. The other stages burn liquid oxygen with liquid hydrogen. The first stage engines burned for 168 seconds which was able to lift Apollo to a height of 67 km (42 mi) and about 93 km (58 mi) away from the take off place. The second stage burned for about 8 minutes to take Apollo through the upper atmosphere. At this time it was going 25,182 km/h (15,647 mph). The third stage was used for 2.5 minutes to put Apollo into an Earth orbit. This was at a height of 191.2 km (119 mi) above the Earth. The third stage was started again and burned for 6 minutes to make the speed go up to 40,320 km/h (25,054 mph) needed to send Apollo off to the Moon. ↑ 1.0 1.1 1.2 1.3 "Saturn V: America's Moon Rocket". airandspace.si.edu. 2007. Retrieved 12 August 2012. ↑ 2.0 2.1 Furniss, Tim (2001). The History of Space Vehicles. London: Grange Books. ISBN 1-84013-370-8. Wikimedia Commons has media related to Saturn (rocket). This page was last changed on 23 March 2019, at 05:55.